The next generation of the ultimate Smartwatch built for kids is here – Kurio watch 2.0+! 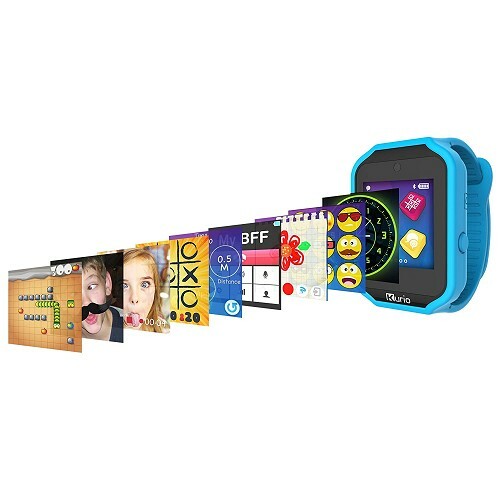 packed with preloaded apps & games, plus, everything you need in a real Bluetooth Smartwatch, Kurio watch lets kids start the fun right out of the box. Now it comes with two (2) interchangeable bands to match your style! 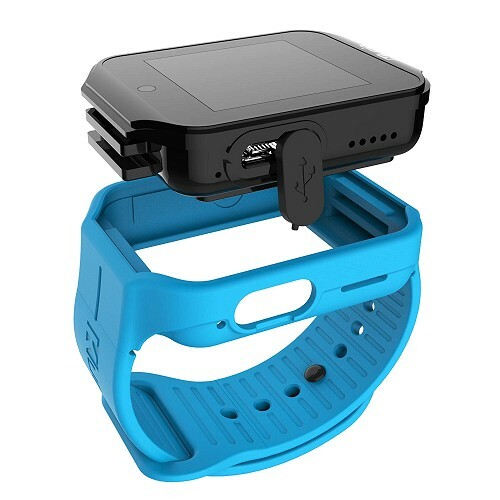 kurio watch comes loaded with games to play alone or with a friend – connect watches via Bluetooth to play on two screens or play together on one device. Motion-sensitive games like snake & Ninja roll use precise wrist movements, while sports challenge makes you feel like you’re in the game! watch-to-watch messaging via Bluetooth lets kids share texts, emojis, photos, doodles and voice recordings! friends and family can even download the Kurio watch messenger app on any Android device to get in on the fun. The Kurio watch includes a front-facing camera perfect for selfies and recording videos. Kids can make silly faces or add to the fun with photo filters & frames! best of all, kids can customize their watch! personalize your watch face and choose a wallpaper from cool themes or even use a custom photo. All Kurio watch 2.0+ bands are interchangeable, so pick your favorite color and swap it in! 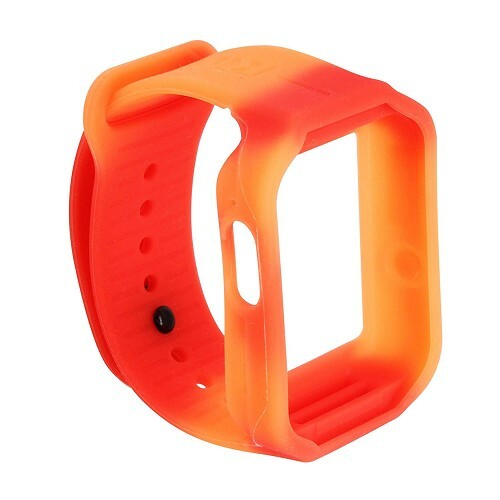 an included bonus band changes color right on your wrist! plus, Kurio watch comes with everything you need in a Smartwatch – activity Tracker, music player, alarm/stopwatch, calculator, calendar and so much more! 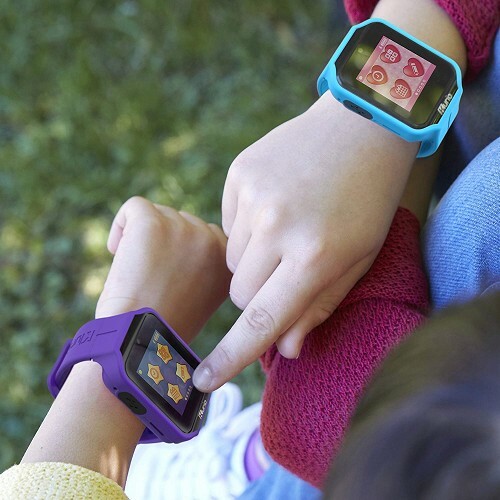 connect to a parent’ s smartphone via Bluetooth and Kurio watch becomes a hands-free way for kids to make and take phone calls (no phone or contract required). 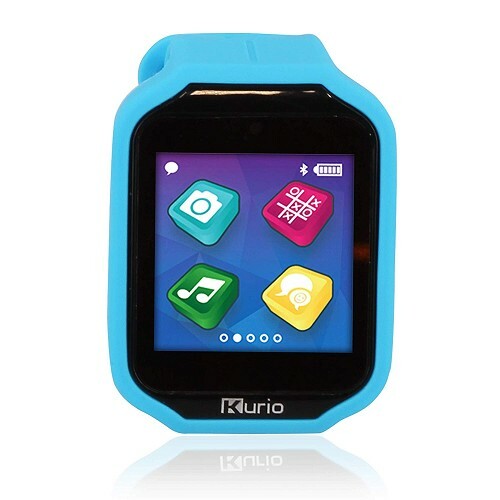 kurio watch is built kid-tough to be scratch resistant and splash proof, so kids can wear it almost anywhere. The watch also features an “ in case of emergency; (I.C.e.) app where parents can enter their child's medical information, including blood Type and allergies, as well as emergency contact details! 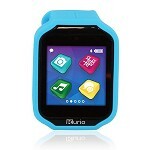 Kurio Watch 2.0+ is a real Bluetooth Smartwatch built especially for kids, packed with apps & games! Now comes with two (2) interchangable bands to match your style! Included bonus band changes color right on your wrist! 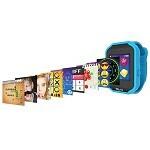 Play single and two-player games on one watch, or connect two watches together via Bluetooth, plus motion-sensitive games that get kids moving! Message friends via Bluetooth to share texts, emoji's selfies, doodles and voice recordings with other Kurio watches & Android devices. The front-facing camera is perfect for selfies and recording videos make a silly face to add to the fun with photo filters & frames! Plus, everything you need in a smartwatch-activity tracker, music player, alarm/stopwatch, calculator, calendar and so much more! Connect to a parent's smartphone via Bluetooth as a hands-free way to make and take calls. No phone or contract required!